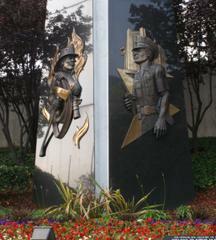 All are welcome to attend the annual Police and Fire Memorial Ceremony on Tuesday, May 3, 2016, at 9:00 a.m. The ceremony will take place at the foot of Chestnut Avenue, south of Broadway, near Long Beach City Hall. A 21-gun salute is included in the ceremony and nearby residents may hear loud or resounding discharges between 9 a.m. and 10 a.m.
At tomorrow’s event, Long Beach Police and Fire Department personnel, along with city dignitaries and staff, will honor those individuals who made the ultimate sacrifice with their lives while serving the Long Beach community. Historical research deemed appropriate that Patrolman William Homer Waggoner be added to the list of fallen police officers. Officer Waggoner passed away in 1954 as a result of injuries sustained in a gun battle nearly 24 years earlier. The memorial ceremony will include the Pledge of Allegiance led by a Long Beach Police explorer, posting of the colors, an invocation, a 21-gun salute and Taps by the Long Beach Police Honor Guard, individual recognition of fallen officers and firefighters, and a bagpipe performance of Amazing Grace, as well as remarks by Police Chief Robert Luna and Fire Chief Mike Duree. *This year’s ceremony will be the last to be held at this site due to the Civic Center renovation.